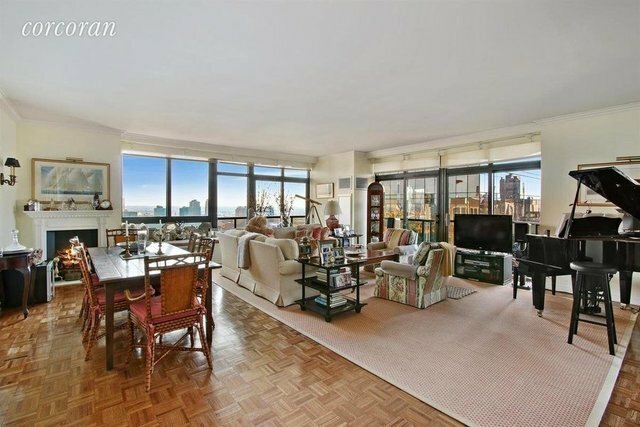 Fantastic 35th floor corner 2 bedroom 2 bath apartment with amazing city and river views and two balconies now available at 100 United Nations Plaza - one of Manhattan's premier white glove condominiums. This high floor 2 bedroom layout is highly sort after and rarely available for purchase. This home boasts spectacular open city and river views from the South and East facing floor to ceiling windows throughout this apartment. The over-sized living room is an amazing space - perfect for entertaining. Two sliding doors in this room access a large wrap balcony. The apartment and balcony have breathtaking city and river views that include the Empire State Building, Chrysler Building, New World Trade Center, the East River and much much more. The large master suite features a dressing area, great closet space, its own balcony and an ensuite marble bathroom with a stall shower and separate bathtub. The wall from the living room to the second bedroom has been opened up giving this room the flexibility to be used as part of the great living area or as a second bedroom/guest bedroom. WASHER DRYER in the apartment too! Great layout - Fantastic light - Amazing views from every room - 9 foot ceilings - Over-sized windows - 2 private balconies - New Parquet wood floors. Pets Allowed (1 Dog - Maximum weight 50 pounds). What a truly fantastic opportunity! Don't miss this one. Shown by private appointment. Located on East 48th Street and First Avenue in Manhattan's great Turtle Bay neighborhood - 100 United Nations Plaza has an amazing staff, 24 hour doorman, valet and concierge service, beautiful renovated lobby, on-site management office, renovated meeting room/party room , beautifully landscaped gardens with waterfalls, laundry room, a residents only fitness center and an attached 24 hour attended garage. Conveniently located to transportation and many great restaurants and shops.